ROM Hacking Discussion / Should a hack of a hack follow the same rules of "fair use" as an initial hack? I've always found the attitude towards using someone else's hack as a base for another hack to be completely contrary to the very concept of ROM hacking to begin with. Aside from the basic politeness of INFORMING someone that you intend to use their work as a base, permission really seems to be besides the point of the entire endeavor. Credit where credit is due, but if an initial hack falls under "fair use" how can a hack of a hack not full under the same rules? What is everyone's opinion out of curiocity? Devil's Castle Dracula vs Demon Castle Dracula? I'm wondering if one is TECHNICALLY more correct than the other for translating Akumajō (悪魔城)? Is it common for this sort of arrangement of kanji (a being+a thing) to signify ownership such that an 's is warranted in an English translation there of? Like if I were to write inukotsu 犬骨 can that be translated as dog's bone? That doesn't seem right to me. After all inugoya isn't dog's house it's doghouse. Personal Projects / What ever happened to the Kyuuyaku Megami Tensei translation? Could some of you more fluent gentleman give me a hand? 魔天童子 - ma tendou ji according to google translate (I know, I know) is Magical Tendou Child. I understand tendou is "a god in the guise of a child", so would it be reasonable to assume this is a pun? Vampire Killer for SEGA Mega Drive. 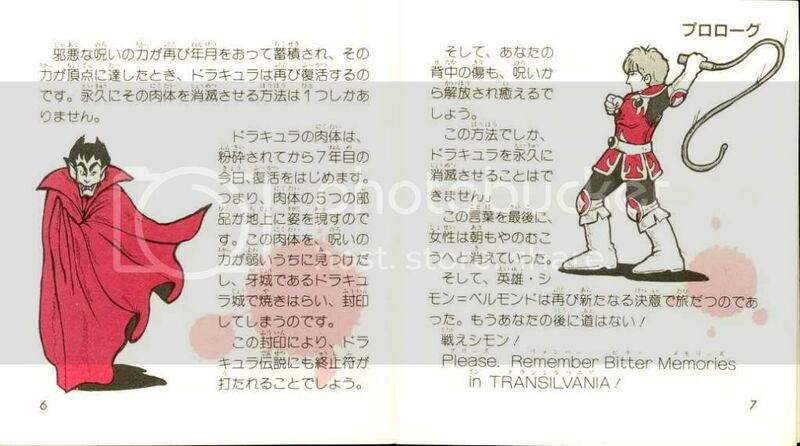 I don't need a full translation, but I do need to know if there's anything in here that indicated that Dracula's Second form is actually Drolta or that her body was used as a recipticle to revive Dracula. Hi. I'm working on a small addendum patch for the Akumajou Densetsu translation's title screen. I ran out of space in the tile map to add in the "sprocket holes" that are used in the intro sequence, not to mention that I'd have to change the background palettes to accommodate one more color that doesn't really fit the rest of the palettes well. So I decided a better solution would be to simply draw the "sprocket hole" sprites using the OAM since there should be plenty of space for the 28 sprites I'd need to draw. However, I immediately noticed something I've never seen before and don't know how to deal with. The OAM in AjDen is constantly being written to in a way that doesn't make any sense to me at all. The title screen only has two sprites visible on it; the left and right sides of the "Holy Cross" sub-weapon which is used as a cursor. The actual attributes for these sprites are there, but they're constantly shifting around the OAM in a pattern. And on top of that instead of the rest of the space in the OAM being empty it's filled copies of the two sprites written to Y-position F4. The code that writes to the OAM is constantly running so I haven't been able to make heads or tails of where the hell it's pulling attributes from much less how to get it to draw additional sprites. So, please help & thanks in advance. Clue 01: A SYMBOL OF EVIL WILL APPAER WHEN YOU STRIKE THE STAKE. Clue 02: DESTROY THE CURSE AND YOU'LL RULE BRAHM'S MANSION. Clue 03: A FLAME FLICKERS INSIDE THE RING OF FIRE. Clue 04: CLEAR A PATH AT BERKELEY MANSION WITH A WHITE CRYSTAL. Clue 05: TO REPLENISH EARTH ,KNEEL BY THE LAKE WITH THE BLUE CRYSTAL. Clue 06: DESTROY THE CURSE WITH DRACULA'S HEART. Clue 07: GARLIC IN THE GRAVEYARD SUMMONS A STRANGER. Clue 08: AN OLD GYPSY HOLDS A DIAMOND IN FRONT OF DEBORAH CLIFF. Clue 09: WAIT FOR A SOUL WITH A RED CRYSTAL ON DEBORAH CLIFF. Clue 10: PLACE THE LAURELS IN A SILK BAG TO BRING THEM TO LIFE. Clue 11: DRACULA'S NAIL MAY SOLVE THE EVIL MYSTERY. Clue 12: THE CURSE HAS KILLED THE LAUREL TREE. Clue 13: DRACULA'S EVIL KNIFE BLURS CAMILLA'S VISION. Script Help and Language Discussion / A hand with the CV2 Backstory from the Japanese Manual, Please. between 魔法使い / mahoutsukai and 魔道士 / madoushi? Script Help and Language Discussion / Little help. This is what I interpret this as. PS- I know the convention is Dragoon, but I don't care about that. This time I'm doing only one ability at a time and then adding them to this first post as we go along, cause I'm at work and I don't have time to do them all at once. Have at you, guys! Ｌｖ１までの白魔法と黒魔法が使えるようになる - made no shiro mahou to kuro mahou ga tsukaeru you ni naru --> Gain use of white and black magic up to level 1. 次のターンまで使われた魔法を一度だけ無効化しＭＰを回復する - tsugi no TAAN made tsukawareta mahou o ichi do dake mukouka shi MP o kaifuku suru --> Until next turn, each time magic is used nullify it and restore MP. 魔法剣が使えるようになる - mahou ken ga tsukaeru you ni naru --> Sword Magic becomes usable. セットしている魔法を２回連続で使える - SETTO shiteiru mahou o 2 kai renzoku de tsukaeru --> Any equipped magic can be used twice consecutively. 敵からギルを盗む -> teki kara GIRU wo nusumu -> Steal gil from the enemy. 戦闘から逃げ出す -> sentou kara nigedasu -> Run away from battle. 敵がアイテムを落としやすくなる -> teki ga AITEMU wo otoshi yasuku naru -> Enemies drop their items more easily. 敵からアイテムをぬすむ -> teki kara AITEMU wo nusumu -> Steal an item from the enemy. 不意打ちとバックアタックを防ぐ -> fuiuchi to bakkuatakku wo fusegu -> Prevent surprise and back attacks. 速さが10％アップする -> hayasa ga 10% APPU suru -> Agility is raised by 10%. 敵に攻撃を与えアイテムをぬすむ -> teki ni kougeki wo atae AITEMU wo nusumu -> Attack the enemy, steal an item. 敵がレアアイテムを落としやすくなる -> teki ga REA AITEMU wo otoshi yasuku naru -> Enemies drop their rare items more easily. I've been researching this game and I need help translating the skill descriptions and maybe even correct some of my own. I'll do one job at a time so I have time to integrate the info into my spread sheet. ---敵単体にクリティカル攻撃をする -> Critical attack on one enemy. ---敵単体にダメージを与え「混乱」状態にする -> Damage one enemy and inflict "confusion" status. ---敵からの物理攻撃に反撃することがある -> You occasionally counter an enemy's physical attacks. ---自分の防御力を下げて、攻撃力を上げる -> Lower your defense, but raise your attack power. ---スロットが＋１される -> Number of slots increase by one. ---味方全体の物理攻撃力を上昇させる -> Increase all allies' physical attack power. ---ダメージを与えて瀕死になる -> falling into near-death status in the process. ---敵単体に２連続で攻撃する -> Attack an enemy twice. ---敵全体にダメージ -> Inflict damage on all enemies. ---力をためて次の行動の威力を上げる。 -> Charge energy, raising the power of the next action. ---一度に３回までためることができる -> You can charge up to three times at most. ---敵単体をランダムで異常状態にする -> Inflict a random status ailment on one enemy. ---敵単体に聖属性のダメージ -> Deal Holy damage to an enemy. ---体力が２０％アップする -> Stamina raised by 20%. ---通常攻撃を無効化し反撃する -> Until your next action, there is a fixed chance to cancel and counter normal attacks. ---味方のＨＰと一部の状態異常を回復する -> Recover an ally's HP and cure some status effects. ---敵単体のＨＰを半分にする -> Cut an enemy's HP in half. ---敵単体にダメージを与え「混乱」状態にする -> Deal damage to one enemy and inflict "confusion" status. ---敵単体に複数回ダメージ -> Damage an enemy multiple times. ---敵全体に土属性ダメージ -> Deal Earth damage to all enemies. Script Help and Language Discussion / Help with some confusing names from various games. I'm going to be posting here some items from various games that I can't figure out the significance of to save my life. Hopefully some of you guys have some insight on these that I lack. Item effect: teleports party out of the current dungeon. Same effect as the Exit spell. And while I'm at it, anybody have any idea what the hell Esuna/Basuna are supposed to mean? 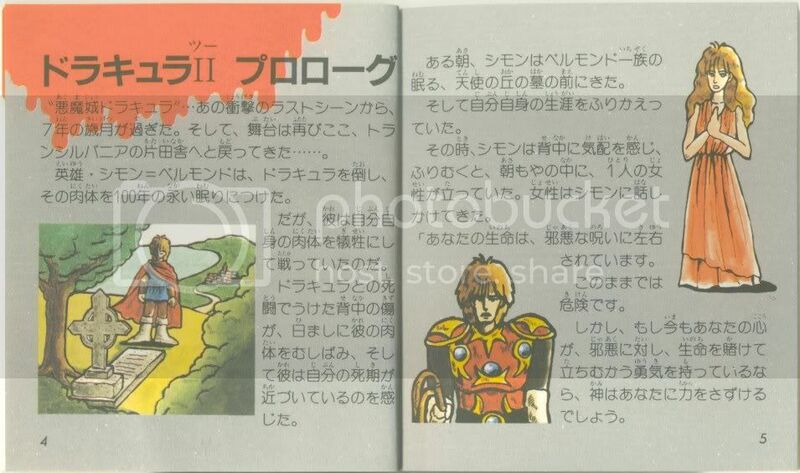 Script Help and Language Discussion / FF3 Famicom table file? Looking for a table file for the original FF3 as part of a documentation project. 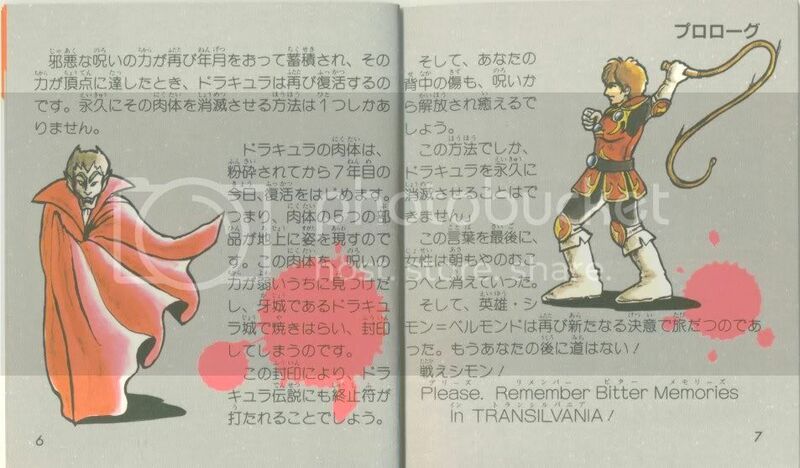 Either that or if anyone knows of an existing document that includes all the original Japanese text for the game including all battle and menu text. Need this translated for a project I'm doing. 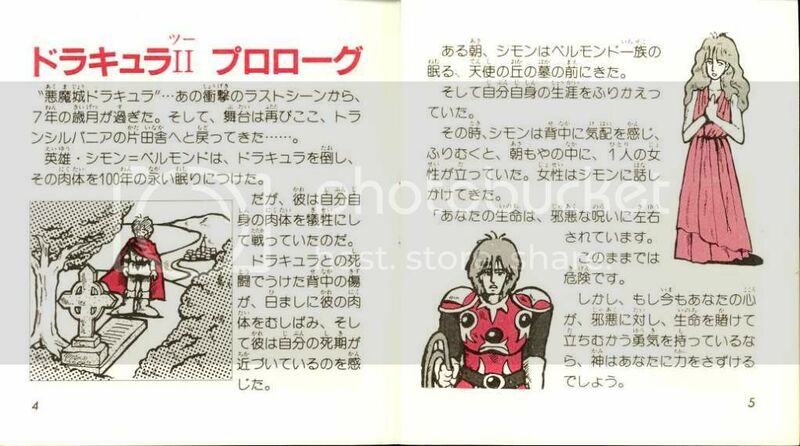 Supposedly it's an explanation of the story for the Japanese version of 8 Eyes. I was getting a bunch of NES translations together and trying them out when I noticed this thing in Kid Niki 2 (Kaiketsu Yanchamaru 2: Karakuri Land) that kinda bugged me. The intro had this little graphic that said . Immediately I thought that this just wouldn't do so I fixed it. What I need from you guys is your opinion on which version of the graphic looks best. The aim of this project is to take Lindblum's FF7 NES translation and make it more FF7-ish. Basically it will be a face-lift project. *Redraw all sprites in the game to match FF7 better. This will include changing a lot of enemies into those from FF7 instead of FF3. The spell effects could use a face-lift also. *Redraw all tile sets to match their FF7 locations better. The train station shouldn't look like Castle Sasoon, right? *Arrange FF7 music and insert to replace FF2 & 3 tunes. Vanya > director, digital artist. As stated in my last post, Lindblum has gotten into contact with me about he project once more. He will be providing support in the form of notes and tools he developed for the translation and subsequent enhancements he was working on. Yay!! I've been slowly working on some new tiles for the game and will have some screen shots up by months end. Huzzah!! After several months of nothing going on here, and much real life happening, I'm back to work on this project. At this point I'm going to start anew and will be asking for help from anyone that is interested in getting this project done. I'm going to need help in two particular areas; music and ASM. I still don't know jack about composing, remixing or what not so I will need someone who can down-mix the FF7 music. I'm still learning ASM myself, so I could really use a hand on that end as well. There are some improvements to the games engine and some additional features that will require someone fluent in 6502 ASM. If you are interested in contributing or were on the team before and would like to help out again, please feel free to drop me a PM. UPDATE: This hack is cancelled and is now a GM project.